Most basement remodeling tips center around keeping a specific goal in mind. You should know the things you absolutely want to accomplish with your remodeling, and the things you’re willing to go without. This is important when you’re on a budget, because based on your personal plans, you may be forced to make some decisions based on priorities. That doesn’t mean you can’t have fun with it though, only that you’ll need to do some more extensive price comparisons and research when you begin. 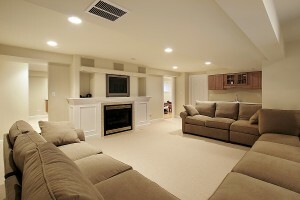 One of the tips for remodeling your basement on a budget is to recognize its individual needs. Your basement is a unique part of your house, so you’ll need to factor in its naturally beneficial or adverse qualities. For example, you can go with some cheaper materials for installing simple dividing walls, but you’ll want to choose flooring that will not lead to moisture-based damage. Explore flooring options with your contractor to see if they have an inexpensive tile or vinyl selection. Also, remember that investing a little more in quality products now could save you more money on repairs in the future. In terms of style and design tips for remodeling your basement on a budget, remember that patience is a virtue. It may seem like you need to wrap up your project as quick as you can, but it’s okay to take your time finding more economical aesthetics. Maybe there are a few structural details that your contractor can help you with, but it’s possible remain cost efficient with décor after the bulk of remodeling is done. If you’ve considered various basement-remodeling tips and ideas, but still have questions, it’s best to communicate with a professional to determine how they can help you achieve your goals while sticking to your budget.